Volunteer sign-ups expected to be available starting Monday, November 5th at 3:00pm PT on the website only. Please check back for details and updated information. Thank you for your interest! Sign ups are now closed, thank you! 3. Under select shift, pick volunteer shift again. 3. Select number of volunteers in your group. Minimum is 6 and maximum is 20. 4. Select available date (in white). 5. Select available shift time (WHITE BOX). 6. Input your information to finalize appointment. ON MONDAY, NOVEMBER 5th THROUGH OUR WEBSITE. will be taken over the phone. LINES. PLEASE PLAN TO BE FLEXIBLE THE DAY OF THE EVENT. Volunteer registration is for groups of 6 OR MORE ONLY and a maximum of 20.
guarantee that a volunteer assignment will be given. ALL Volunteers must have a liability form signed when they arrive on-site. guardian. Click here to download the liability form. must be present in order to check in. Wednesday, November 21 – Vegetable preparation at the Anaheim Convention Center, Hall E.
All volunteers will park at the Anaheim Convention Center need to enter at the guard shack off West Street. Guards will be there. 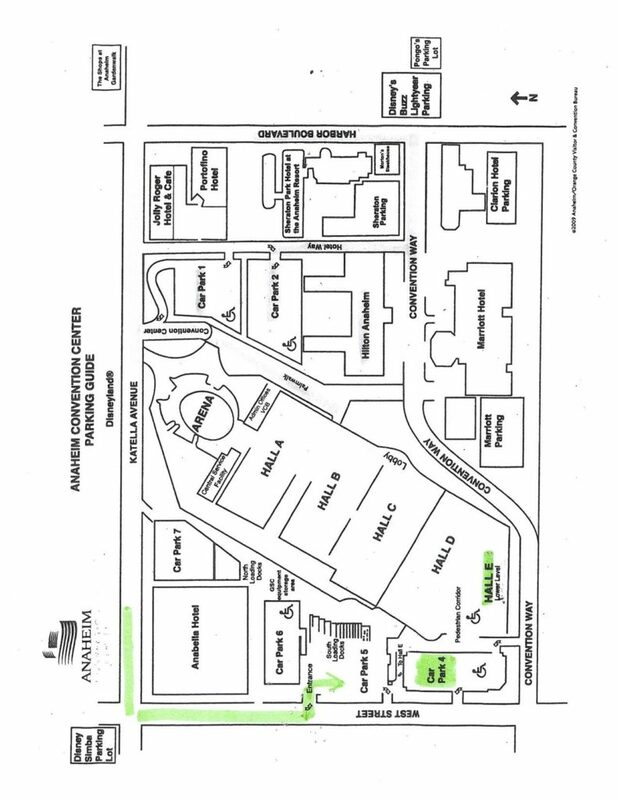 Volunteers need to identify themselves and then will be directed to the correct parking lot. On the first level of the parking garage, you will enter the back of Hall E through the pedestrian doors. There will be other signs as well to prevent any volunteers from getting lost.  Closed toed shoes of non-slip variety. Preferably no tennis shoes.  Some form of hat or hair covering (baseball cap, plastic food processor cap, hairnet, etc.) must be worn.  Please do not bring any kitchen utensils onto the premises (knives, peelers, etc.).  Everything will be provided for you.  No outside food is permitted on the premises. VOLUNTEERS FOR WEDNESDAY AT THE ANAHEIM CONVENTION CENTER MUST BE 14 YEARS OR OLDER. If you are under the weather, have a cold or sickness, or have any type of cuts on your hands (even if covered with band-aids), we ask you please not to volunteer due to health reasons. Volunteers who fail to adhere to the above will NOT be permitted to volunteer. Thanks for your understanding and cooperation! This is for everyone’s safety! • MUST BE 18 YEARS OR OLDER TO WORK IN THE KITCHEN AREA. plastic food processor cap, hairnet, etc.) must be worn. • Please do not bring any kitchen utensils onto the premises. Everything will be provided for you. • No outside food is permitted on the premises. (even if covered with band-aids), we ask you please not to volunteer due to health reasons. Volunteers who fail to adhere to the above will NOT be permitted to volunteer. Thanks for your understanding and cooperation! This is for everyone’s safety! All volunteers will park in Lot 4. 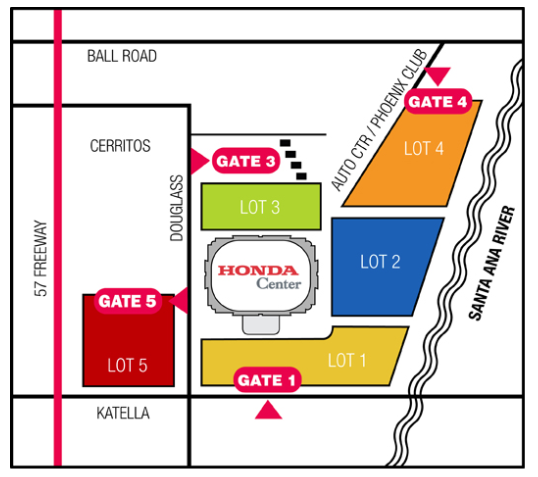 The event will take place in Lot 5. Check-in will take place at designated volunteer check-in area on the Honda Center premises. Please like us on Facebook to receive up to the date information.